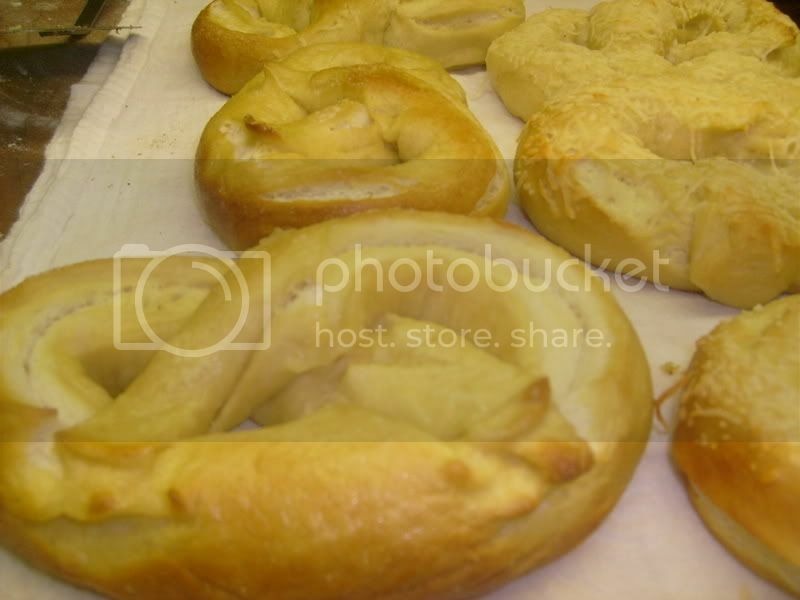 Melanie's Closet Project Blog: Get your hot pretzels! So, it's not crochet. But it IS a project I undertook and I want to share. Don't give me lip! Look at the blog name... no really, take a look. Up. A little further. There. Melanie's Closet Project Blog is not an inspired name, I grant you that, but Mike thought of it for me years back when I wanted to sell the products of my hook and he set this blog up for me to, so I keep it the way it is. Til I'm bored. :) Fickle, fickle, me. I was struck with the desire for hot fresh pretzels last night and like any normal person, I decided to make them myself. I live 30 miles away from the nearest city and 'bout everything in it closes up at 10 pm, so unless my craving is for an Apple Martini, I'm out of luck. I need to be self sufficient. LOL, I say that as thought pretzels were a staple of pioneer times. I made bagels before and pretzels aren't so very different, I felt confident I could do this. As usual, I was completely right about me. I have good instincts when it comes to me. So I made half the batch plain with salt and the other half with parmesan cheese. Oh, so good! Soft and warm out of the oven, they were exactly as I hoped they would be. I made up a little melted garlic butter for dipping and I felt complete. Deep sigh. "mom! mom! mom! mom! mom! mom! (one with every up or down bounce) can we have one of the ... um....(wildly sketching the vague shape of a pretzel in the air near my head)...?" Yes, yes you can. I was smiling about how cute it was. They loved my food, it feels so good making something people appreciate, do you know what I mean? Then as I woke up a little I remembered that these kids have eaten an apple after dropping it in the dog water, fishing it out and then dropping it again in the dirt near our front porch steps. They also think Fruity-O's are ok to eat after they hit the floor because, and I quote "they're dry, mom"
But I loved the pretzels and so did Mike even though he laughed and said it was so adorable that I do that as I took pictures to show my online friends how good I was. OK, maybe I didn't get my credit where credit was due, but I enjoyed a darn good midnight snack and the feeling of accomplishment over making something yummy. Can someone tell me now.... are they supposed to have that green tinge? I know the ones at the mall stand do, but it's the mall food court. Things often don't have colors found in nature. I'm just curious and hoping I haven't lethally poisoned us. Maybe the kids take after me more than I thought, because after all, do many adults eat a food that's oddly greenish then later ask if it was ok? Most of the pretzels I've seen have a sort of tinge to them. Could also be that I'm crazy and think I see strange colors everywhere, but I'm a fair and just person and pretzels are yummy no matter what color they are. Your kids are so adorable! Could be because I don't have to live with them and so don't get to see when things might otherwise be frustrating. So I send lots of love to you and them. And to Mike. Because he hates the taffeta. And maybe some hugs would change his feelings toward taffeta. Here are the Fingerless Gloves! They grow so quickly, don't they?